In prior Future of Health Care blog posts, we’ve discussed issues facing our health care system as we look to provide new solutions for better and safer patient care at reduced costs. Our conversations have centered on needed steps to make this happen such as mending our fragmented care system, funding research, and improving our reimbursement model. We need to challenge ourselves to create a truly patient-centered model of care and put the incentives in the right place to curb costs and keep people healthy. Mayo Clinic has been perfecting this model for 150 years and I felt privileged to share some of our insights with my colleagues and to learn from them at the World Economic Forum Annual Meeting 2014 in Davos, a small ski town in the Swiss Alps. This year health care took center stage and I had the honor of serving as one of the healthcare governors at the WEF where more than 2,500 leaders including heads of state, CEOs of top global companies, representatives of multinational institutions and NGOs, and members of academia and media gathered to discuss the most pressing issues facing the world. 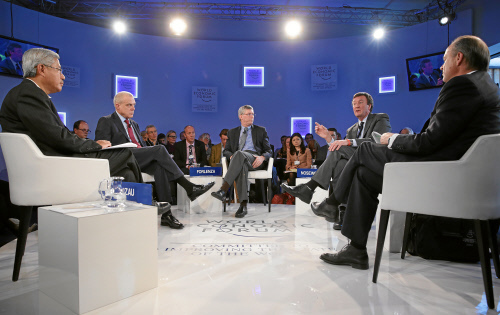 For the last several years, globally economic issues have understandably dominated much of the Davos agenda leaving issues like health care to be discussed at the margins of the forum. This year, health care and its primary role to stabilize and drive the world economy took center stage. I was delighted that the WEF leadership recognized the opportunity and immersed the Davos delegates in topics concerning health and well-being, peppering over 25 sessions woven throughout the public and private program. The conversations ranged from health challenges (e.g. the rising burden of mental health, dementia, non-communicable diseases), the effects of technology and hyper-connectivity, to medical breakthroughs in personalized medicine, big data and digital health. We debated how an outcomes-based approach improves the sustainability of the systems in the mature economies and how emerging economies leapfrog to enable better performance. These great conversations allowed health care to be seen as an economic and societal issue -- one that will need the attention of society as a whole, not just medical professionals. One of the building blocks of the more sustainable systems of the future will require public-private partnerships to empower individuals to take greater responsibility for their health and well-being -- a new ‘health contract’ of sorts. Focusing on outcomes will shift the economics of being healthy from “health as a cost” to “health as an investment”, leading to more productive societies and economic growth. The value of Davos is that it is a truly “multi-stakeholder reunion,” as Klaus Schwab, the founder of WEF, explained in his welcoming address. The Forum’s purpose is to “improve the state of the world” – what better place to start than health care.